A Friends of City Park membership offers City Park visitors exclusive perks around the Park. *Friends of City Park membership does not include rides. For information on an Amusement Park Season Pass click here. ** Boating and Biking discounts are not applicable during Easter, Memorial Day, 4th of July, or Labor Day weekends. Friends of City Park Members receive a free subscription to New Orleans Homes and Lifestyles Magazine. If you wish to opt out of this subscription, please email friends@friendsofcitypark.com. Friends of City Park reserves the right to change membership perks at any time. 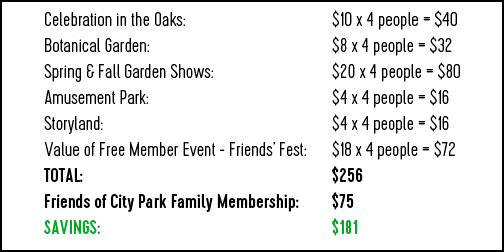 Friends of City Park memberships are annual and non-refundable.